What I Call Her is a new play written by Ellie Moon and performed in partnership with Crow’s Theatre. Opening night was a great success, filled with the thrill and jitter of any new performance. Audience members greeted each other, proud parents beamed, and we all admired the wonderfully designed set. I don’t think I’ve ever seen a set look so successfully like someone’s home. Complete with semi-shabby-semi-old-fashioned-totally-loved couch, casual bookshelf with relevant titles, jade plant, and yoga mat in a corner, a lovely an intimate tone was set for the show. As the performance began, the actors took a little time to settle comfortably into their roles. However, once they got into the swing of things, the small ensemble worked as a cohesive unit. There were genuine moments of honesty and bravery that worked so well it felt a little uncomfortable to be in such close proximity to the actors. There were some deliciously funny moments too, times where I’m sure the audience was nodding along thinking of their own experiences. 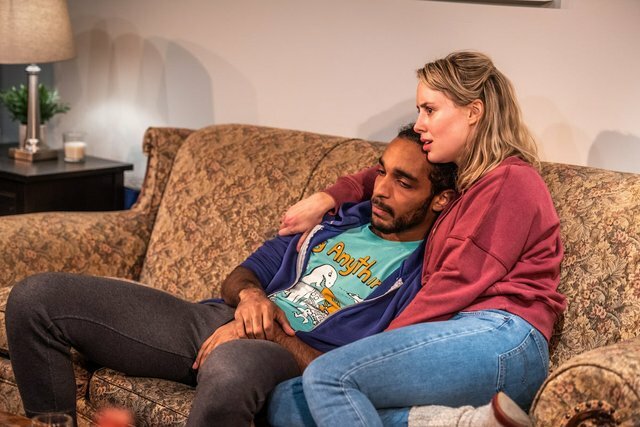 Overall, all three actors, Michael Ayres, Ellie Ellwand, and Charlie Gould should all be commended for working with such success on an interesting, complex, difficult, emotional, thoughtful, and relevant new work. I would like to congratulate Ellie Moon on creating a work with such real characters, complete with all their complications and flaws, and bring up so many interesting and difficult aspects of how to navigate in our post #MeToo world. The play centers on themes of grief, family, relationships, and most prevalently abuse. Moon considers the implications for how abuse is viewed, how even the same circumstance can look different through another set of eyes. She notes the problem of intergenerational abuse, and how abusing others, especially within family power dynamics, can be unintentional, cruel, and change lives forever. How do we go about healing from abuse? In the age of #MeToo, does speaking out begin the healing process, or make it harder? If you speak to someone or write down your true feelings, is that enough, or do your words need to be made public, where you could be berated, and even mar others’ opinions and memories? Should that even be a consideration? Through the tense relationship between sisters, Moon develops this conversation with bare truth and passion. She investigates where our anger comes from, or our fear, and how quickly we can change from the person we think ourselves to be. There were a few moments in the evening where the timing was a little off, or the play seemed to drag slightly, but all artists involved should be immensely proud with their accomplishments in What I Call Her. An excellent play that provokes thought and consideration, I would absolutely recommend it to others, and look forward to seeing more of Moon’s work in the future.